A beautiful view in Blue Hill. I’m a fan of downtowns. It matters not if they are large metropolitan areas with hundreds of shopping and eating options or small, one-street communities with a single diner and general store. There is just something about that downtown vibe that I don’t get in shopping outlets or malls. My most recent downtown find is perched on the edge of the Blue Hill Peninsula and is about a 1½-hour drive southeast from Bangor. Frankly, that drive alone is worth the trip. The roads wind toward the coast through Bangor, Brewer, Ellsworth and other smaller towns until I arrived in Blue Hill. The physical landscape is a mix of blueberry barrens, stony ridges, tree-lined valleys, rivers, lakes and finally sweeping views of Blue Hill Harbor and the Gulf of Maine beyond. Architecturally it’s a collection of farm houses, small cabins, larger new homes, 100-year-old snug cottages and imposing sea captain’s homes. It all speaks to the atmosphere of the area that is equal parts agriculture, tourism and working waterfront. The Blue Hill downtown area has enough of the above to make that drive for a day trip or long weekend totally worth it. For a community with 2,666 permanent residents, according to the 2010 Census, it’s not an overstatement to say Blue Hill has something for everyone, regardless of what time of year you visit. Early spring is certainly a more relaxed time of year, without the hustle and bustle of the summer tourism season. But on a recent February visit, I still found plenty to do and see to keep me busy over a two-night stay. My visit to Blue Hill began at The Blue Hill Inn (40 Union St., bluehillinn.com), where my tiny dog and traveling companion Chiclet and I checked in to the pet-friendly Cape House Suite. Innkeeper Duncan Hamilton was not around when we arrived but had left clearly written instructions for me on where I was staying and where to park. Once inside, Chiclet and I found more instructions that covered everything from how to operate the propane heater to accessing the internet. There was a fully stocked refrigerator with yogurt, juice, milk, locally baked bread and local eggs for me in the kitchen, and on a table in the sitting area was a silver bowl full of dog biscuits and chewies for Chiclet. It felt like we were getting the VIP treatment, but it’s what every guest can expect. There was even a fireplace with a freshly laid logs just ready for the match and a comfy dog bed ready for a tiny dog. It was welcoming, cozy and a perfect base for our Blue Hill explorations. We had arrived relatively late in the day and the light was fading, but there was still enough daylight for a walk down the town’s main street that runs paralleling the water of the bay from the intersection with Union Street up to the cemetery on Route 15. Along the way Chiclet and I passed art galleries, cafes, churches, a hardware store, an auto repair shop, real estate brokers, boating supply businesses, banks, a wine store, a book shop and finally the Blue Hill Co-op. In other words, everything a resident of visitor could possible need within a 1-mile stroll. After our stroll, I tucked Chiclet back in our cottage on her bed, and I headed out to find some supper. I ended up at Thurston Co. Restaurant & Bar (66 Main St., thethurstonco.com), where even on a Monday evening in the winter they recommend making a reservation, which I had done on their user-friendly website. Inside there was the option of sitting at the cozy wooden bar backed with a variety of Maine-made beer and spirits or at a table in the dining room. Within minutes of opting for a small table a slice of fresh, multigrain bread baked on the premises appeared in front of me. Thurston & Co’s menu is heavily skewed to local ingredients, and it was a tough choice among entrees that include the Gulf of Maine shrimp and grits, the fish and chips, or griddled meatloaf. In the end, I decided to combine two appetizer items to make my dinner. Let me just say this about that — the bowl of hot, housemade roasted pepper and tomato soup and the overflowing plate of Blue Hill Bay mussels served with toasted kale and more of that toasted bread was simply perfect on a blustery coastal evening. I also had a gin and tonic, featuring Maine-made Hardshore Gin. For dessert, which I took to go given how filling the soup and mussels were, I ordered a chevrie cheesecake with toasted pistachios with a lemon and grapefruit curd. It made a fantastic late-night snack. It was obvious from our walk the previous day that to fully explore the downtown of Blue Hill, all I needed were my two feet and Chiclet’s four paws. So on our first morning we headed out to find that all-important cup of coffee. We ended up at Bucklyn Coffee (24 Parker Point Road, bucklyncoffee.com) a tiny coffee and pastry cafe that is one of those great morning gathering spots. While waiting to place my order I chatted with a couple who owned a local gallery; a dad and his toddler-age son on his lap, who created enough crumbs on the floor below as he ate a scone to keep my tiny dog very busy; a local retired woman; and a young man in for a quick cup of coffee to go as he headed out for a day at his construction job. As for the coffee? It was hot, strong and robust. So much so that I bought of pound of beans to bring home. From Bucklyn’s I went back to the inn to enjoy my coffee before heading back out to retrace my steps from the previous evening. Later, I ended up at the Blue Hill Wine Shop (138 Main St., bluehillwineshop.com), which has everything a person could want for a summer al fresco picnic to a winter fireside nosh. After some deliberation and expert help from the staff, I left with a bottle of Chianti tucked under my arm. Had I been in the market, I also could have purchased cheese, dried sausage, pastry or bread to accompany it. From there it was an easy stroll up the road to the Blue Hill Co-Op Community Market & Cafe (4 Ellsworth Road, bluehill.coop), where shelves are filled with local and imported foods, beverages, wine, beer, candy, beauty products, produce and books. Out in back is the cafe, which is open for breakfast and lunch only but also has a refrigerated case full of fresh salads, sandwiches and other to-go items if you get there after they close. Walking back to town with two organic chocolate bars added to my day’s purchases, I took a side trip to Blue Hill Books off Main Street at 26 Pleasant St. ( bluehillbooks.com). It is everything a good, independent bookstore should be — not too big, well stocked without being overwhelming and the kind of place you can spend hours browsing the shelves. There are how-do books on gardening and farming, books by Maine authors, popular fiction, historical tomes and everything in between. I could not leave without a copy of a collection of E.B White’s essays. I mean, the man lived and wrote just a few miles down the road on a saltwater farm in Brooklin for nearly 40 years after he purchased the property in 1936. How could I resist? Because I was there in winter, many of the shops and galleries lining the streets were closed for the season, but that did not stop me from doing some serious window shopping at locally produced art, crafts and other creations along the way. Chiclet and I ended our first full day in Blue Hill down on the waterfront on the small bay just in time to catch the sunset as it turned the clouds from fluffy and white to jagged, with hues of oranges and reds. From where we stood, it looked like half the bay was encased in ice with open water maybe a quarter-mile or so offshore. Quiet, cold and windy this evening, it was not hard to imagine a summer scene of pleasure crafts and fishing vessels bobbing in the waters or tied to the docks off-loading lobsters, haddock and tourists. Nearby, a pile of lobster traps half-obscured under a recent snowfall were silent testimony to the working nature of this waterfront. 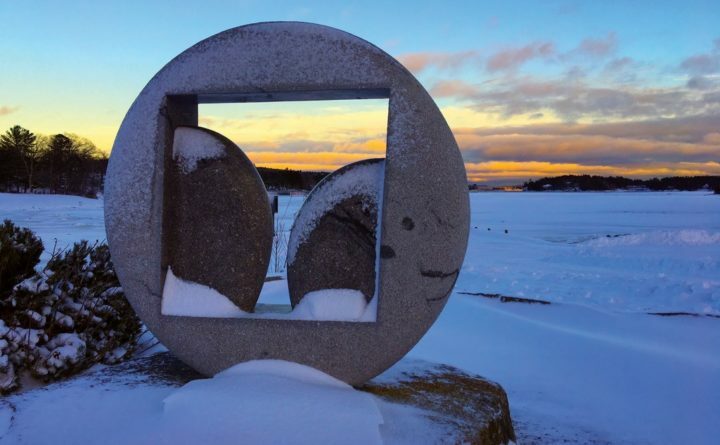 Off to the side and next to the water is a large granite sculpture with two semi-circles in its core. “The Window of the Sea” was created by Japanese artist Hitoshi Tanaka in 2011. Known as “Blue Hill’s welcome window,” looking through the center of the creation offers a view of sky and water from the Blue Hill side, or a view of the town and hills when approached from the sea. As the light faded, Chiclet and I trudged through the foot or so of snow surrounding the statue to gaze out at the bay. It was definitely a view that made the snow in my boots worth it. Back at the inn it was closing in on supper time. I opted for a fresh pizza made at Merrill & Hinckley (11 Union St., merrillhinckley.com), one of those great grocery stores that is also a cafe, liquor store, hunting supply store and souvenir shop. Simply put, if you can’t find it at Merrie & Hinkley’s the first time you look, just dig a little bit deeper — or ask one of the friendly folks working there. I was in the mood for that pizza, but there was also homemade chili, chicken stew, sandwiches and burgers available. As I waited for my pizza — topped with bacon, tomatoes and spinach — I chatted with the young man preparing the corn on the cob for the next day’s corn chowder. Oh, and that pizza? Perfect ratio of dough to toppings. Fresh, tasty and the perfect end to my day. The next day I decided to try out The Harbor House (27 Water St.), where everyone seems to know your name within minutes of walking in. Owner and chef Kathy Eaton has run the place for the past five years and will tell you she has the best view in town. Looking out the large windows at the bay beyond, it’s hard to argue. It’s a friendly place with winter seating for about 20 around the half-dozen tables. In the summer months, seating extends out to the deck and courtyard outside. Eaton’s breakfast and lunch menus feature traditional fare like pancakes, omelettes, sandwiches and soups. Then there are her own homemade pastries, like cupcakes, cannoli, crescents and cheesecake. Or something I vow to try when I return — a blackened haddock Reuben with sauerkraut. Eaton herself is gregarious and takes time to chat with everyone who comes in. When she realized she did not have any blueberries on hand for her special blueberry pancakes I ordered, she offered to run to the store and buy some. Instead, I opted for apple pancakes with no regrets. In the summer months Eaton offers scheduled or by-reservation afternoon high tea in her tea room. Outfitted with antique tea settings, lace tablecloths and tea time beverages and finger foods of her own creation, the teas have proved to be very popular. Last summer, her children’s tea with a “Charlotte’s Web” theme sold out within minutes. She plans to bring back her teas this summer and add a tapas bar to the restaurant. Eaton can tell you on any given day what is open, what’s happening and suggest things to do. And if she can’t, one of the locals enjoying a coffee or muffin will chime in with suggestions of their own. Winter along the coast of Maine is a wonderful time. It’s serene and holds a stark beauty with the rocky coast buried under snow. The boats, tourist shops, farms and outdoor venues seem to be sleeping, just waiting for the warmth that brings the influx of people and activity. Come summer, Blue Hill offers numerous concerts, community theater, fairs and farmers markets. I, for one, can’t wait to go back and take it all in. The Blue Hill Inn is open year-round but only serves its signature breakfasts and brunch during the summer months. It has 11 rooms in the main building, in addition to the two cottage suites. The area is dotted with rental cottages that open in the summer. To narrow down your selection, head to Maine Vacation Rentals ( mainevacationrentalsonline.com) or Peninsula Property Rentals ( peninsulapropertyrentals.com).